Aric Almirola started 34thand finished Stage 1 in the 11thposition. The Tampa native made a scheduled green-flag pit stop from the 16thposition on lap 23 for fuel, four tires and adjustments to help with the No. 10 Ford Fusion’s front turn. After scheduled green-flag pit stops cycled through, and with improved handling, Almirola worked his way up to just one spot shy of the top-10. He pitted at the conclusion of the stage for four tires, fuel and adjustments. With varying pit strategies Almirola came down pit road 11thand went out in the 15th spot. Almirolastarted Stage 2 in 15thand completed it in 23rd. 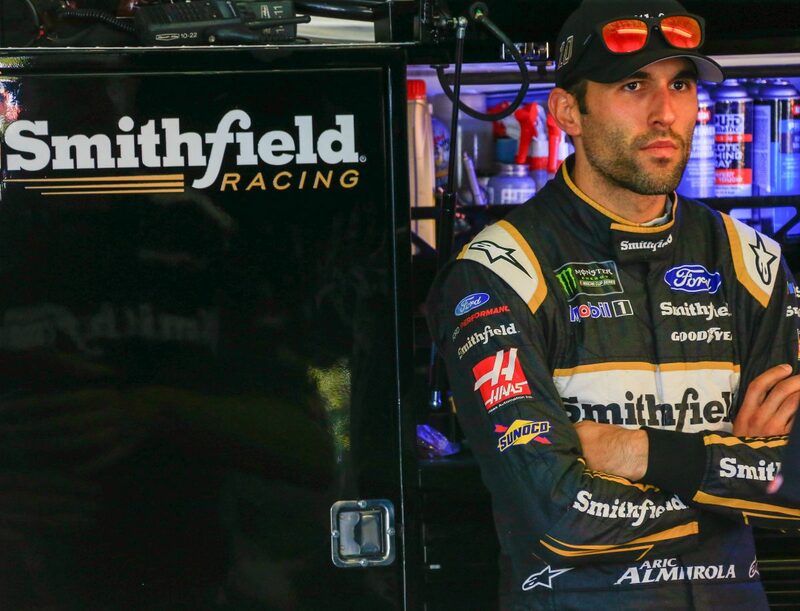 Shortly after the restart Almirola reported the Smithfield Ford Fusion was struggling in traffic, but he continued to work his way forward during the run. On lap 76 Almirola came down pit road from the 12thrunning position for fuel, four tires and adjustments. The first caution of the race came out on lap 83 while Almirola was in the 18thspot. Crew chief Johnny Klausmeier made the call for Almirola to stay out. He restarted 10thon lap 86 and made a scheduled green-flag pit stop on lap 96 for fuel, four tires and adjustments. Visiting pit road just before the stage ended allowed Almirola to stay out during the break and gain track position. Almirola started the final stage in the sixth position and ended it 25th. On lap 121 Almirola made a pit stop under caution for fuel, four tires and adjustments while running in the ninth spot. When exiting his pit stall, Almirola made contact with teammate Kevin Harvick, resulting in Almirola having to come back down pit road for repairs. Fortunately, the next caution came out after just a brief green-flag period, and Almirola’s team was able to work on the car again. Almirola started from the 29thspot on lap 132 and did his best to gain track position with a damaged Smithfield Ford Fusion. The red flag was displayed for just over 10 minutes after an incident on lap 155. Almirola once again took the opportunity to come down pit road for service. Just before the race reached its scheduled distance, Almirola spun on the track, bringing out the final caution and sending the event into overtime. The Ford driver ultimately finished 25th in his damaged No. 10 machine. Kyle Busch won the Gander Outdoors 400 in overtime to score his 49thcareer Monster Energy NASCAR Cup Series victory, his sixth of the season and his second at Pocono. His margin of victory over second-place Daniel Suarez was 1.788 seconds. There were seven caution periods for a total of 29 laps. Twenty-eight of the 40 drivers in the Gander Outdoors 400 finished on the lead lap. The next event on the Monster Energy NASCAR Cup Series schedule is the Go Bowling at The Glen on Sunday, Aug. 5 at Watkins Glen (N.Y.) International. The race starts at 2:30 p.m. EDT with live coverage provided by NBC. Prerace coverage begins at 1 p.m. on NBCSN.